World over, the need to secure lives and property has been at the forefront of every community. With the emergence of new trends and patterns in crime, security agents have been tasked with developing newer and robust systems. Technology has influenced the gathering, analysis and dissemination of intelligence across the globe to secure life and property. Nairobi has experienced the shift in security technology adoption with the installation of surveillance and monitoring systems offering real time data collection pegged on the fiber technology. DG Properties, in its one of a kind residential development project has taken matters security into account in consultation with security agents and technology firms to offer the best system within its 3 Bedroom Exclusive Apartments project; DG Oasis. 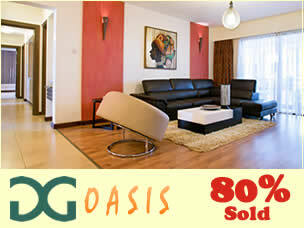 Phase One of DG Oasis Apartments consists of 128 three bedroom apartments for sale with DSQ. Located in South C, the project is implementing an advanced security system for the residents. The investment in the high-end security system is a deliberate effort to safeguard the development and offer peace of mind, enabling the residents to enjoy complete living without fear or trepidation. This system comprises of a three tier unit. The perimeter wall with an electrified fence offers the outer layer. Videocom access control for each building and apartment forms the second layer, and finally CCTV monitoring and access control at the main gate with communication to each apartment. All the driveways and public areas including the ZEN gardens, and the multi use outdoor recreational areas will be installed with LED street lighting as an additional safety feature. Manned guarding services will also be at hand operating on a 24hr basis. Careful selection and vetting has taken place in procuring the services of a top level security firm with regional repute. While in your apartment at DG Oasis South C, you can rest assured that you are protected by the 3 tier security arrangement. When you are not in your apartment, you can set the Motion Detectors to trigger the alarm in the event there is an intrusion. The Motion Detectors are part of the buying price and will be fitted and tested in all the apartments. All the doors are fitted with high end locks. To the discerning home buyer looking for a safe secure home, look no further as DG Oasis is the ultimate residence offering just that.